The Lemon Cichlid is a very popular Lake Tanganyika cichlid renowned for its brilliant yellow/orange coloring! The Lemon Cichlid Neolamprologus leleupi is a beautiful African cichlid from Lake Tanganyika with a fairly peaceful demeanor. It is a relatively small cichlid, with males reaching just shy of 4 inches (10 cm) and females being slightly smaller at just 3 1/2 inches (9 cm). With its personality and brilliant coloring it makes a beautiful addition to a mixed species aquarium. Yellow colored fish are more of a rarity in freshwater aquariums, making this handsome cichlid highly sought after. This is perhaps the best known cichlid to have ever been exported from the lake. The first specimens were exported back in 1958, but it was quite rare and expensive until the 1970's, when it began being bred in large numbers. Other common names it is known by are the Leleupi, Orange Leleupi Cichlid, Gold Cichlid, Gold Leleupi Cichlid, and Tanganyikan Lemon Cichlid. This cichlid can vary wildly in its coloration, ranging from a bright yellow to a deep brown, depending on its place of origination within the lake. Consequently early on this species was thought to consist of 3 subspecies. The first, which is the nominate species, is N. leleupi leleupi, and it is the typical bright yellow fish. The second was darker in color and described as N. leleupi melas. The third was also a bright yellow but with a more elongated body, and was described as N. leleupi longior. This third fish is now recognized as its own species, Neolamprologus longior, and is commonly known as the Elongated Lemon Cichlid. The dark morph is now recognized as just that, a dark color variety. The dark morph was found to have the same yellow pigment as the yellow morph, but it was obscured by black pigment. These cichlids have been carefully bred in captivity to selectively eliminated the dark pigmentation. There can still be a wide variation in color in the aquarium specimens, fluctuating from yellow to orange to red, but that is usually related more to diet and habitat. These captive bred specimens are often called descriptive names like Firecracker, Dutch Orange, and Super Bright Orange. This is a great fish for both the intermediate and experienced cichlid keeper. It is hardy and not difficult to keep as long as it is fed live foods and as long as mandatory water changes are done (and difficult if they are neglected). Providing a diet of mysis shrimp and other live foods high in carotene will help promote the luminous yellow/orange coloring. A bottom of light colored fine sand will help keep their vibrant color. Yellow or orange fish should be kept over a light colored substrate or they will tend to turn dark. This can make them appear muddy or "dirty". They also need plenty of hiding places and spawning sights with rocks, wood, flowerpots and ceramic caves. Plants are not essential but can be included. They will not harm the plants nor will they burrow. In the wild the Lemon Cichlid is usually found alone and a pair will only come together for reproductive purposes. Though relatively peaceful, they can get aggressive with others of their own kind. They do best when kept singly or as a pair. A minimum sized aquarium of 20 gallons is suggested for a single fish or a pair. They are cave spawners, and a pair will readily breed. Young siblings from a spawning pair will usually get along okay, but others will not be tolerated. These cichlids are inoffensive fish with other species, so can be kept in a community aquarium with other durable fishes as long as they have their own territory. To keep several, or to keep this fish in a community environment, the aquarium should be good sized with 40 gallons being a minimum but 75 gallons or more being preferable. 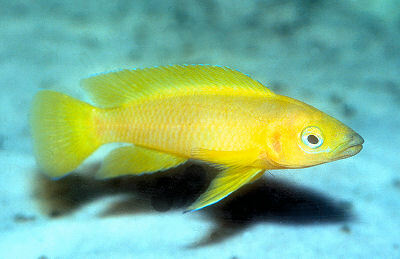 The Lemon Cichlid Neolamprologus leleupi was described by Poll in 1956. These fish are endemic to Lake Tanganyika, Africa and is found in the southern half of the lake and along the entire east coast. This species is listed on the IUCN Red List as Lease Concern (LC). Although it is endemic to Lake Malawi, it is widespread and has no recognized threats at present. Other common names this fish is known by include Leleupi, Orange Leleupi Cichlid, Gold Cichlid, Gold Leleupi Cichlid, and Tanganyikan Lemon Cichlid. Captive bred specimens have been specifically developed for just the yellow/orange coloring. Some common names these are described as include Firecracker Cichlid, Dutch Orange Cichlid, and Super Bright Orange Cichlid. The Neolamprologus genus is the largest genus of cichlids in Lake Tanganyika, containing 50 or so species. The fish in this genus are all closely related but they are split between "shelldwellers" and "rockdwellers", yet all are substrate spawners. This genus is also the largest group in the tribe Lamprologini. The Lamprologini tribe contains seven genera and nearly 100 species of African Cichlids, most of which are found in Lake Tanganyika, though a few species are found in the the Congo River Basin and one species in the the Malagarasi River in Tanzania. The Lamprologini cichlids are highly variable and are found in all kinds of habitats. They are found both at the surface and in very deep waters, but all species are substrate spawners. They have a body that cam be somewhat elongated to very elongated. Their colors tend to be brown, yellow, blue, black or a combination or all four. Black is usually a striping, either vertical or horizontal. Like other genus in the tribe, the Neolamprologus will readily mate with females of other Lamprologini. They are found along the rocky coastlines of both the east and west side of the lake at depths between 16 - 131 feet (5 - 40 m), but are most abundant in the deeper waters at 131 feet (40 m). They are found singly and inhabit the recesses of the rocky terrain. They feed on invertebrates found in the biocover of the rocks and substrate, including zoobenthic organisms, aquatic insects, and copepods. Social Grouping: Solitary - They are found singly, but will form monogamous pairs while breeding. The Lemon Cichlid has an elongated body with a continuous dorsal fin, a fan shaped caudal fin, and large lips. Males typically reach up to about 4 inches (10 cm) in length, though they can grow close to 5 inches (12 cm) in the aquarium. Typically females are slightly smaller, reaching about 3 1/2 inches (9 cm). They can live 8 - 10 years with proper care. Specimens can vary widely in their color. The most commonly seen color is a bright yellow or an orange to reddish color, though they can be a deep brown depending on where they originate from. They have a fine blue or greenish line above the lips that runs to just below the eye, and the eyes are light blue. There are natural variations of intensity and hue, but in the aquarium their color is largely dependent on their diet and the light or dark nature of their environment. Fish kept on darker substrates will be darker and muddy colored. Size of fish - inches: 3.9 inches (9.91 cm) - In nature males will get up to almost 4" (10 cm), though in the aquarium they can reach up to around 5" (12 cm), with females slightly smaller, typically up to 3.5" (9 cm). Lifespan: 8 years - They have a lifespan of 8 - 10 years with proper care. This is a fish best kept by intermediate and experienced cichlid keepers. It is moderately easy to care for as long it is fed live foods. The aquarists must be willing to provide a properly set up aquarium with appropriate tank mates, and be willing to do frequent water changes. It is a more peaceful cichlid that can be kept with other fish, but will be aggressive towards others of its own kind. Since they are carnivores, the Lemon Cichlid needs protein foods. In the wild they eat zoobenthic organisms, aquatic insects, and copepods. To keep a good balance give them a high quality flake food or pellet everyday. Regularly supplement these foods with brine shrimp (either live or frozen), cyclops, or daphnia. Live protein foods high in carotene, such as mysis, help promote its beautiful coloring. Feed 2 to 5 small portions of food a day in smaller amounts instead of a large quantity once a day. This will keep the water quality higher over a longer time. A one-day-a-week 'fast' can also be beneficial. Of course, all fish benefit from added vitamins and supplements to their foods. Feeding Frequency: Several feedings per day - Offer several small feedings a day rather than a single large feeding for better water quality. Do normal water changes of only 10% to 20% a week, or more frequent depending on the nitrite/ammonia levels and stocking numbers. The Lake Tanganyika cichlids cannot handle large water changes very well unless the new water water chemistry closely matches the water they are in. This inability to tolerate large water changes is due to Lake Tanganyika being very deep and the water tends to stay stable. Water Changes: Weekly - Water changes of 10-20% weekly are suggested. Be cautious of doing more frequent changes as these fish are very sensitive to new water, only do more if the water parameters are off. The Lemon Cichlid is active and will swim in all areas of the aquarium. A minimum 20 gallons for a pair is suggested, while 40 gallons or more would be required if mixing with other species. They need good water movement along with very strong and efficient filtration. Lake Tanganyika is a very oxygen rich lake so bubblers need to be going day and night, even if there are plants. Regularly check nitrates and ph, nitrates should be no more than 25 ppm and a pH less than 7 is not tolerated. In addition keep an eye on total hardness and carbonate hardness. Avoid overfeeding and overstocking. Salt is sometimes used as a buffering agent to increase the water's carbonate hardness. An alternative buffering approach is to use a chemical filtration method, where they water passes through layers of crushed coral or coral sand. Interestingly, Tanganyikan cichlids also need iodine for the thyroid to function properly to regulate growth and development, and which can be achieved by adding iodized table salt to the water. Although rift lake cichlids need hard alkaline water they are not found in brackish waters. This cichlid has some salt tolerance so can be kept in slightly brackish water conditions. However it not suited to a full brackish water tank. It can tolerate a salinity that is about 10% of a normal saltwater tank, a specific gravity of less than 1.0002. Provide a sandy to very small sized gravel substrate. Along with a good diet, a light colored substrate will help them keep in their brilliant coloration. In a dark environment they will tend to turn dark and begin to look muddy. Sand used for salt water tanks can help keep the pH up as well as the addition of crushed coral. Crushed coral and aragonite sands do tend to dissolve easier than salts. They need a lot of rocks and cave formations. Plants are not essential though they do not harm them, nor do they burrow. Minimum Tank Size: 20 gal (76 L) - A minimum 20 gallons is suggested when kept single or as a pair, 40 gallons or more would be required if mixing with other species. Suitable for Nano Tank: Sometimes - A large nano tank, 20 gallon or more can be used for a single fish or a pair. Breeding Temperature: 77.0° F - Breeding temperature ranges between 77 - 86° F (25 - 30 C). Range ph: 7.8-9.0 - Wild caught specimens prefer the higher pH. They are fairly non-aggressive community fish. They can be kept in a smaller species only tank or in a larger aquarium with other durable fish, as long as they have their own territory. They are best kept with mild-mannered tankmates such as other Tanganyikan cichlids of the genus Julidochromis such as the Dickfeld's Julie and the Convict Julie, the genus Altolamprologus,such as the Compressed Cichlid and the White Pearly Calvus, as well as Synodontis catfish. It is best to avoid housing them with African cichlids from Lake Malawi or Lake Victoria. Though relatively peaceful, they can get aggressive with others of their own kind. In the wild the Lemon Cichlid is usually found alone and a pair will only come together for reproductive purposes. Young siblings from a spawning pair will usually get along okay, but others will not be tolerated. To keep several, or to keep this fish in a community environment, the aquarium should be good sized. Although it is hard to tell, the male has a fuller body, a larger head, and often has a cranial hump. The male's pelvic fin is longer. The Lemon Cichlid or Gold Cichlid are egg layers. The female is a sheltered substrate spawner and prefers spawning in caves. When breeding they will form monogamous pairs and a nuclear family, but only while tending the fry. The female guards the clutch while the male defends the territory. One source states that L. leleupi will change to polygyny in captivity. This fish has been bred in captivity and will readily spawn. Start with 6 or more juveniles and allow them to pair up. After a pair has formed, transfer the pair to a 20 - 30 gallon aquarium with rocks or other decor that create several caves for spawning sites. The breeding tank should have slightly alkaline, medium hard to hard water with to a pH of around 7.5 - 8.0, 10 - 15° dGH, and a temperature between 77 - 86° F (25 - 30 C). It's best if the caves have small opening just big enough for the female to enter. If not enough shelter is provided the male may kill the female if she's not ready to spawn. Digging in the substrate around the decor indicates the fish are starting to breed. A 50% water change may help stimulate spawning. Females typically deposit 50 - 150 eggs on the roof of the cave and the male will then fertilize them. The female will hide within the spawn site and guard the eggs while the male defends the spawn site. The eggs hatch in 4 days and both parents will defend them, but will not harm them. The free swimming fry can be fed newly hatch brine shrimp and crushed flakes. See the description of breeding monogamous cichlids in: Breeding Freshwater Fish: Cichlids. Lemon Cichlids are fairly hardy in a properly maintained aquarium. These cichlids are susceptible to typical fish ailments, especially if water is stale and of poor quality and oxygenation. One common problem is Ich. It can be treated with the elevation of the tank temperature to 86° F (30° C) for 3 days. If that does not cure the Ich, then the fish needs to be treated with copper (remove any water conditioners). Several copper based fish medications are available for Ich. Copper use must be kept within the proper levels, so be sure to follow the manufacturers suggestions. A copper test also can be used to keep the proper levels. You can also combine increasing the temperature with an Ich medication treatment. The Lemon Cichlid, also known as the Leleupi and Gold Cichlid, is available from time to time. 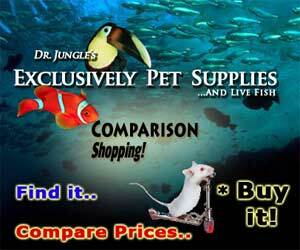 They are found both online and in fish stores and are moderately priced for juveniles with adults being more. How much do these guys cost in India? I badly want one. Please respond. If you are in bangalore, then you are lucky and i can provide you orange lelupii both adults and small. Let me know if you want. To get this fish to have very vibrant color you should feed them foods that have carotene in them. Foods like mysid shrimp and crickets will do fine. A very pretty fish from Lake Tanganyka. Provide this fish with many caves and crevices. They are not agressive to fish of similar size but can definitly hold their own. G'day Ricky,could i keep a Leleupi with a pair of Julidochromis Marlieri.The tank is 6ft.x2ft.x2ft.? I believe this is my fish of 3yrs. Can't kill it you would not believe what it has survived including a whole bottle of stool softner. However I have it alone in 10 gal.moves rocks,eats scales off other fish and won't let them eat. I saw an albino one of these at the walmart by my house. Would it be a good idea to get one. I have a 20 gallon and was thinking about getting the other two in the same as him at walmart so he isn't lonely. please respond. It is recommended that a lemon cichlid have a minimum of a 40 gallon tank just for iteself. They are loners so I wouldn't worry about him being alone and they are frequently kept just as one fish. Are you sure you have a lemon cichlid? They are also carnivores. If another fish will fit in its mouth, it will be considered food.